Use Glass Bead Size 6 ( CP2238 ) or Glass Bead Size 5 ( CP2219 ) at an Almen intensity of F15N. Since I don't know how to past a picture in my message, it will be hard to explain the chart. I can try e-mailing it to you. On the left hand side of the chart shows "N Intensity" with two columns labeled "Inches" and "Afnor". The x-axis is labeled "Diameter of Glass Beads". My question is what is on the chart itself which has vertical lines with corresponding glass bead sizes. My dilemna is that I am showing that with a F15N, the intensity should be 0.010"-0.014"N, but how do I double check this? Added the image to your post above. 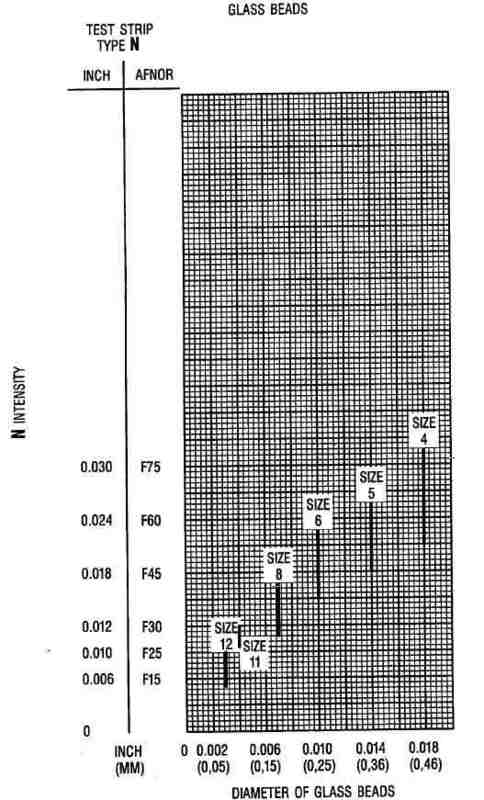 I can only think that the chart gives a guide to the range of intensity that you would get for certain glass bead sizes. I think F15N refers to 0.006" (0.15mm) arc height of almen test at a saturation point where if you doubled the blasting time the arc height would be 10% greater. necessarily an actual data point) commonly referred to as "T", that meets the following criteria: the arc height curve increases by 10% when the exposure time is doubled (or "2T"). # Intensity Determination: A process of determining the peening intensity using a minimum of four (4) Almen strips and generation of a graph using a smooth fit curve to determine the intensity value. Intensity determination is usually done at original machine set-up or after changes to any major process parameter or component. # Intensity Verification (or Confirmation): A process of affirming that the peening intensity is within tolerance of the value established during intensity determination. Only one (1) Almen strip is needed (at each required location) and it is exposed at a time equal to or greater than the saturation time (1T) and less than double saturation time (2T) established during intensity determination. For example, if an intensity of 6-10A is required and the intensity determination was 7.2A, then the intensity verification would have to be within 6.2A and 8.2A. However, the intensity verification must also conform to the peening intensity limits specified on the drawing. # Intensity Determination Tolerance: the tolerance of peening intensity listed on the drawing requirements (for example 6-10A) which allows for repeatability and angle of impingement considerations. # Intensity Verification Tolerance: the variation allowed for confirmation compared to the original set-up intensity determination. The tolerance for "A" and "C" intensities is +/- 0.001 inch and the tolerance for "N" intensities is +/-0.002 inch. Sorry, busy posting the above that I did not see your thread "wrong post" (deleted now). A bit confused, do you really want me to delete this thread?